Hungry?, originally uploaded by ShashiBellamkonda. A hot summer day is not the right day to go to a restaurant as everyone wants to be outside. You enter and see the white table cloth and think this is going to be expensive. But the menu cards arrive and the prices seem reasonable. Staff are very friendly and the dishes are good. 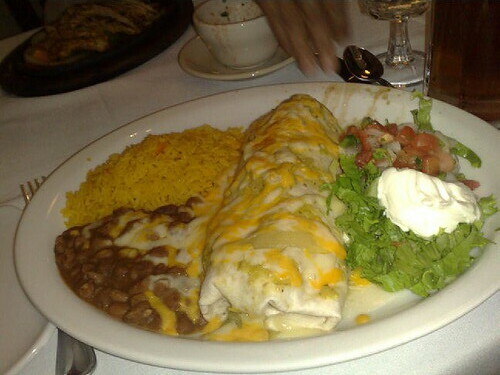 The picture here is a Vegetable Burrito. Actually my family already tried Ixtapa. Well, it's really good. Burritos tastes very good though the sauce is liquidy. Just one comment, they have to improve the presentation of the food. But nevertheless, it's very good. Staff are great!